For Virgin Islanders concerned the government’s large collection of valuable and historically priceless art and artifacts may not be secure after the 2017 hurricanes, there is good news, more good news, bad news and more bad news. The good news is the most valuable items from Government House are accounted for. And, as of last December, there is a substantially complete inventory of most of the government’s holdings, so if something vanishes at least there is a list of what should be there to let future generations know it is gone. That will make any resale of any stolen item difficult and will aid recovery if something does go missing. The bad news is several highly valuable and irreplaceable items vanished from Government House on St. Thomas long before the storms and the new inventory. A priceless Coptic tapestry from the third or fourth century is the most significant item known to be missing. And past inventories were very limited in scope, so there is no straightforward way to even know what else might have walked away over the years. After the September 2017 hurricanes, Government House on St. Thomas stood unlocked indefinitely, leading many to be concerned about the security of priceless historical artifacts and paintings by Camille Pissaro and others, some valued at hundreds of thousands of dollars. For many months, Government House under Gov. Kenneth Mapp’s administration stonewalled requests to see the artwork or to see photographs, demonstrating its security. He hired St. Croix native Julio Encarnacion III as a conservator of the V.I. government’s collections and tasked him with an exhaustive inventory. With no older inventories to compare with, there would have been no way to know if anything had vanished since the storms. To create a partial benchmark, the Source combined data from a 2013 Christie’s appraisal of Government House art that had been previously made public and items Source reporter Bernetia Akin itemized in 2015 by personally going through the disorganized boxes of paperwork cataloguing some of the government’s possessions. The Source published that list in August 2018. In December, after the election, Mapp issued a statement saying the most expensive items from Government House on St. Thomas – several paintings by Camille Pissarro – had been stored on display in Mapp’s personal office in St. Croix Government House. Around the same time, Encarnacion finished his preliminary inventory but the Mapp administration made no announcement. In January, the newly-installed administration of Gov. 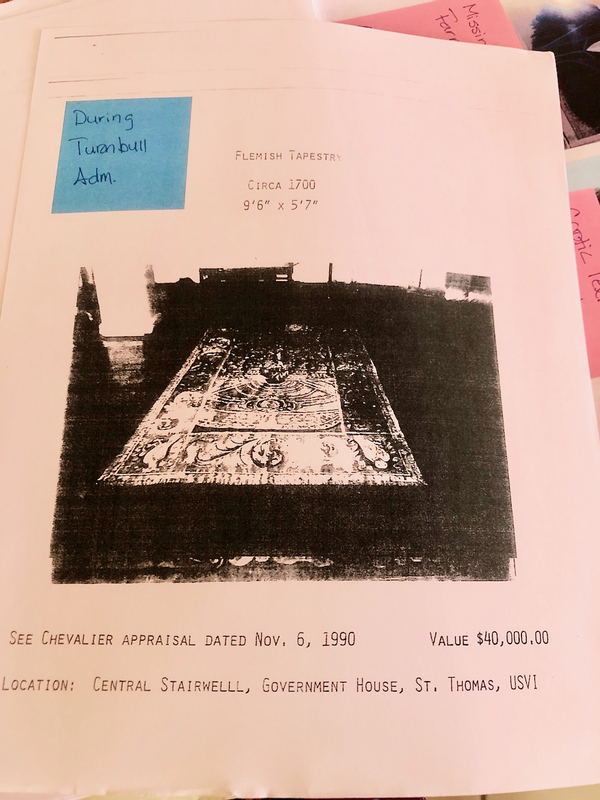 Albert Bryan release several Microsoft Excel spreadsheet files itemizing the art, furniture, silver and other valuable contents of St. Thomas Government House, St. Thomas Government House Annex, Estate Catharineberg, St. Croix Government House and a Sub Base building. Those were compiled by Encarnacion and comprise a portion of the work he performed. Comparing his lists with the Source’s August 2018 partial list showed nearly all of the most valuable items were accounted for. Four items on our list did not appear on Encarnacion’s insurance inventory spreadsheet files. Encarnacion said one of the items: “Bull and Figure,” pen on paper, by Leonard Midori, appraised at $2,000 by Christie’s in 2013, is held in a secure location but would not say where. He said he had personally seen it and that it was insured. A portrait of Edward Wilmot Blyden, the St. Thomas-born father of the Pan-African movement, who helped found the nation of Liberia in the 19th century, painted by Aline M. Kean, a highly-regarded early twentieth century St. Thomas artist. Encarnacion said V.I. government records indicate it was documented to be missing during the administration of Gov. Alexander Farrelly, sometime between 1987 and 1995. A Coptic textile, attributed to the third or fourth century is missing. It was a gift to the people of the Virgin Islands from Norbert Schimmel on Dec. 20, 1954. Encarnacion said it was documented as missing during the administration of Gov. Roy Schneider, between 1995 and 1999. And a hand-woven, wool-on-wool tapestry from about 1700 and probably created in Flanders, showing a stylized fountain in colors of green and blue with some gold, is missing. An inventory in the 1990s estimated its value at around $40,000. Encarnacion said V.I. government records indicate it was noticed missing during Gov. Charles Turnbull’s administration, between 1999 and 2007. Concerns over whether the V.I. government can safeguard valuable art have given donors and philanthropists pause in years past. In one very dark chapter, at a Nov. 17, 2011, V.I. Legislature committee hearing, philanthropist and collector Robert A. Johnson told senators he had a very large collection of V.I.-related antiquities but did not trust the V.I. government with it. He said he would be happy to donate his collections to a federal entity but not a local entity. “I have learned you cannot trust the people here. … I have seen things disappear from Government House over the years – not in recent years but over the years,” the 73-year old Johnson said in 2011. Seeing large numbers of government-owned antiquities vanish “tells me this was one of the perks of the position,” Johnson said. Johnson was found murdered two months later. He was found tied to a chair in his Estate Boetzberg home on Jan. 18, 2012. No arrest has been made to date. Placing the invaluable patrimony of the territory in other hands is no guarantee of security either. St. Croix used to have a set of nine pre-Columbian Taino stone slabs, engraved with petroglyphs – carvings of images – in Salt River, near where Christopher Columbus landed in 1493. The slabs were part of a Taino ball court, the only one documented in this region. They were unearthed by Danish archeologist Gudmond Hatt and shipped to Denmark in 1924. It is not clear they are readily locatable. Efforts by more than one V.I. researcher to locate all nine of the slabs have not been successful to date. 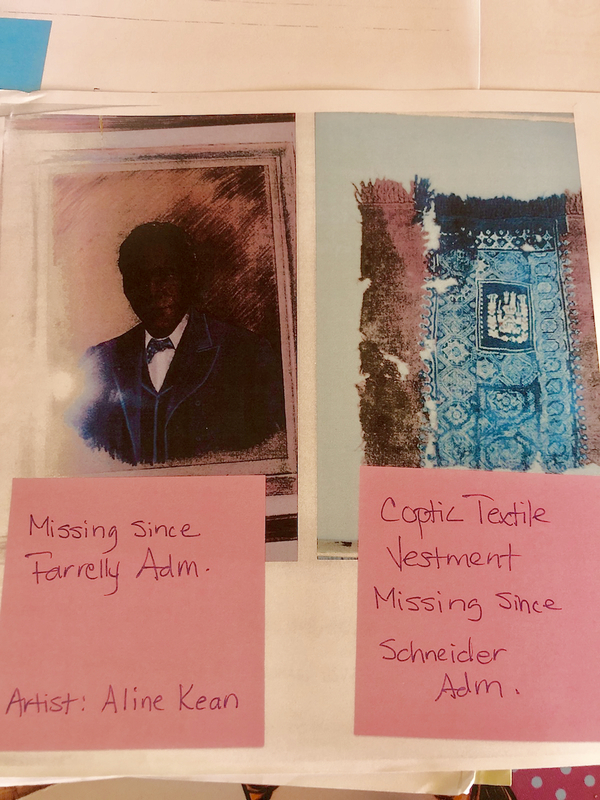 With the Encarnacion inventory, future generations of Virgin Islanders will at least have a benchmark from which to know when items like the Coptic fabric or the 17th century Flemish tapestry go missing. And having that benchmark may make it that much less likely anyone will consider purloining them. Below are the inventory spreadsheets itemizing the contents of six locations, provided by the Bryan administration in January. They are divided by site.